If your car is leaking water, it’s usually not serious — as long as you’re sure it’s water! The car’s air conditioning system creates condensation whenever it’s activated. It’s normal to see small puddles of water near the back of the engine compartment. In addition, water near the tailpipe is usually exhaust condensation, and that will go away after your muffler warms up. However, there can be more serious issues associated with leaking fluids. 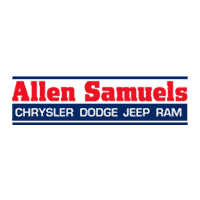 Feel free to stop by the service center at Allen Samuels Chrysler Dodge Jeep Ram near Nickerson for a quick inspection. Water leaking from under car? Follow these steps to find where it’s coming from. Place a sheet of paper under the leak. If the fluid is something other than water, the color will show up in the paper. If it’s blue, green, or yellow, it’s probably coolant, not water. If more than a small amount of water is coming from your exhaust, a blown gasket may be causing coolant to be burned along with the fuel. That will result in large amounts of water and white smoke coming out of the exhaust pipe. While coolant is usually easy to spot due to its color, you can always check the level to make sure. If it’s low, you’ll want to bring your car to a certified service center quickly. A leak could be coming from a cracked windshield wiper fluid reservoir. That can be caused by using water in your windshield wiper fluid. The water freezes in the reservoir, expanding and causing the plastic container to crack. You can tell it’s windshield wiper fluid by its light blue or light green color. Wiper fluid leaks can usually be found by the front tires. If the cause is anything other than condensation, it’s worth visiting Allen Samuels Chrysler Dodge Jeep Ram near Nickerson. Allen Samuels Chrysler Dodge Jeep Ram is happy to help customers from Newton and beyond identify the source of any leaking fluids. Contact us with any questions today, and remember to browse our service specials and see how easy it is to save on car care. 0 comment(s) so far on Why Is My Car Leaking Water?